Our flower is now complete, but it needs a stem and some leaves. For this part of the project, hoop an extra light nonwoven stabilizer or some organza. I used painted Carriff stabilizer, but a green organza would work just as well. If you use stabilizer, you might want to paint it green with some fabric paint. Set up your sewing machine for free motion work, making sure the feed dogs are in the lowered position. Attach a free motion or darning foot. 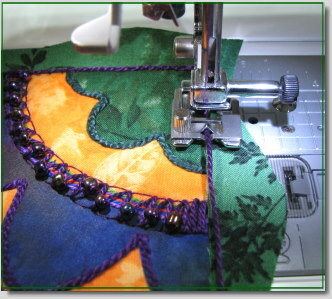 Set your machine for straight stitching or a very slight zig zag stitch. 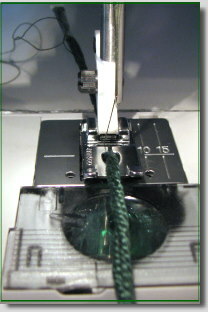 Loosen the top tension a point or two and thread the machine with embroidery thread. I used Valdani Cotton Look #40. Of course, it’s always best to make a test sample before actually stitching your project. 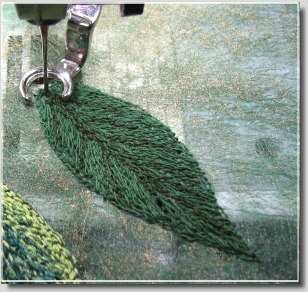 Begin by stitching an outline of your leaf shape. Next, move up and down the center of the leaf. Adjust your hoop so that you can stitch in a diagonal direction and then work one side of the leaf by stitching straight lines back and forth, making sure you stitch into the outlined edge. When that is complete, move to the next side and mirror image the diagonal stitching. 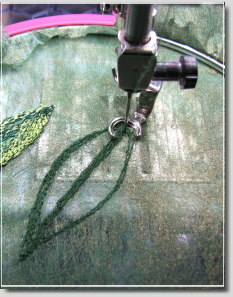 Now thread your machine with a dark green thread and stitch some veins on the surface of your leaf. Repeat the process for your second leaf. When your leaves are completely stitched, set your hoop on a piece of glass. 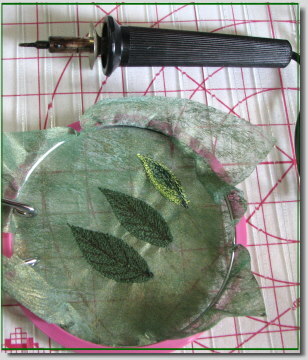 Heat up a stencil cutter or wood burning tool and move the point around the edges of your leaves. 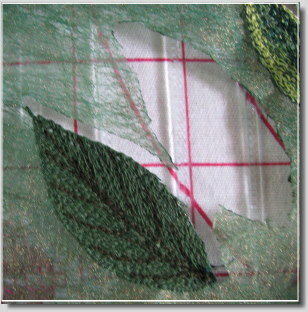 The stabilizer or organza should melt like butter, leaving you with two nonfraying leaves. Do this is a well ventilated area. To create a stem for the flower, cut 5-6 lengths of green #3 or #5 perle cotton. Cut them about 2 inches longer than needed. Tape one end to secure all the threads. 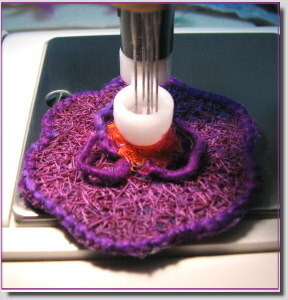 Attach a cording foot to your sewing machine and thread the needle with embroidery thread. You can use the same thread in the bobbin. 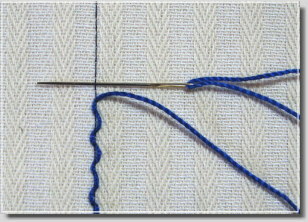 Choose a zig zag stitch and set the width at 4.5 – 5.5 mm. The feed dogs should be raised. Now thread the taped end of your perle cottons through the hole in the cording foot. Sew over the threads, making sure your width clears each side. You can repeat this several times and even use different color threads with each pass. Position your stem and leaves on the front of your project. You may like to tack them down here and there with a light dab of fabric glue. 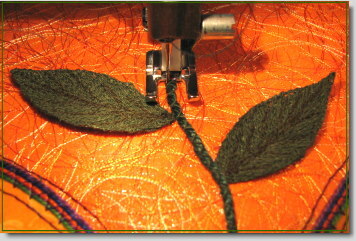 Using an open toe foot, couch your stem and sew a line of stitches up the middle of your leaves to secure them. Now position your flower and tack it down with a little fabric glue. You can blind stitch around the outer edges or tack the flower on with a few hand stitches from the back of your work. At this point, I framed my piece with a wavy border using a fusible to attach it. For the finishing touch, I couched a #3 perle cotton around the inner frame using a braiding foot. These steps are optional, of course, but they do give the piece a nice finished look. Another In Bloom project complete! This has been a whirlwind week. My grandson was scheduled for a Tuesday morning delivery via C-Section, so we left for Augusta on Monday. On the way, we stopped to make a delivery of handbags to a new boutique in the Greer/Spartanburg area. When I checked the blog Monday night, I saw the links from several sites regarding the Thinking Blogger Award, but knew I wouldn’t be able to post my five nominees until I returned home. Tuesday through Thursday I was busy cuddling my grandson! I then returned home only to find my washing machine had sprung a leak, the kind that makes for very clean floors after it’s all cleaned up. That means today will be spent shopping for a new washer and dryer. Although I explained to my husband that this purchase musters the kind of excitement I would have over receiving a new broom and dust pan on Christmas, these really are important items considering all the fabric that gets prewashed, all the fabrics that need to be PDF, and all the items that need to be heat set. So maybe my excitement is one notch above a new broom and dust pan. There are so many wonderful blogs that deserve the Thinking Blogger Award, but the guidelines state five. My thanks again to all those who tagged Fembellish Journal. 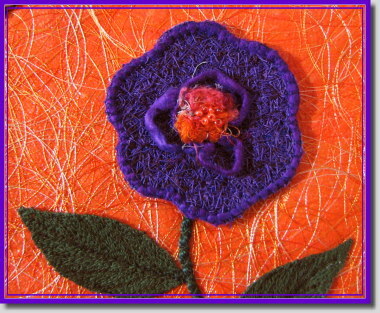 The first three blogs belong to talented fiber artists that live and write their passion. Spending time on their blogs is time richly rewarded and mentally stimulating. The fourth blog, Posie Gets Cozy, finds itself in the sidebar of countless other blogs for good reason. Alicia Paulson designs creative nostalgia. However, she is as gifted at writing as she is at designing. If you ever find yourself stressed, visit this blog. I would describe it as everything a blog should be and then some. The fifth blog is total inspiration. These are artists who paint one picture and day and post them on their blogs. I would love to create one finished piece of art a day! But alas, fiber isn’t always submissive to time. You will give a lot of thought to color after visiting this blog. First, I want to thank Jacqeline (http://jacquelinedejongarts.blogspot.com/2007/04/thinking-about-blogger.html for also honoring Fembellish Journal with the Thinking Blogger Award. I was totally blown away by the first three, but four. . .I’m speechless. And my thanks also goes out to Corina (http://corinaj.wordpress.com/2007/04/19/love-is-all-around/) for her kind words regarding Fembellish Journal. 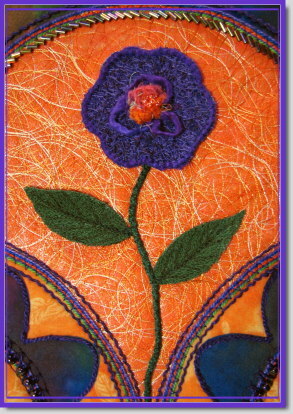 She not only wrote a special post but created her own “Gilded Gardens” fiber art. In part three we worked on reverse couching using one line of straight stitches and perle cotton threads. Now we will double the fun and use two line of stitching. In many cases you can use a double needle to accomplish the following techniques. I didn’t use one on the In Bloom project because I needed the stitches to be further apart. 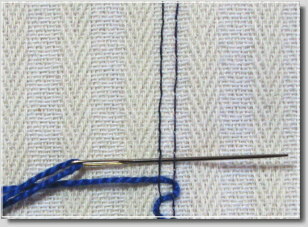 However, these techniques work best when a double needle is used since the stitches are always evenly spaced. 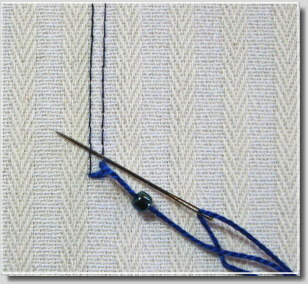 After stitching a row of straight stitches with a double needle at 4.0 mm, thread a tapestry needle with perle cotton. 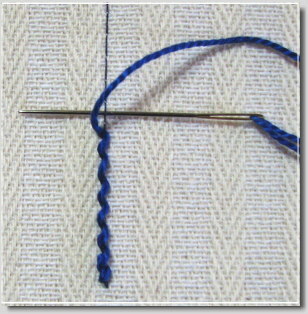 Bring the thread up at the bottom and then position your needle with the point facing the first stitch on the right. Pass the needle under the two two machine stitches. 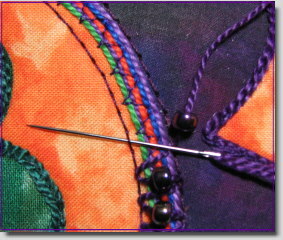 Now reposition your needle with the point facing the next row of stitches from the left. Pass the needle under the next two machine stitches, working from left to right. Continue working in right to left and left to right motions until your pattern is complete. 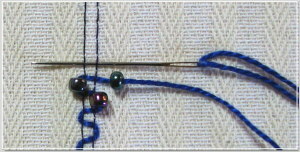 To work serpentine beading, use the same method, only thread a bead onto your needle before passing it under the stitches. Do this on the right and the left. You can also mix the techniques and produce some very special effects. 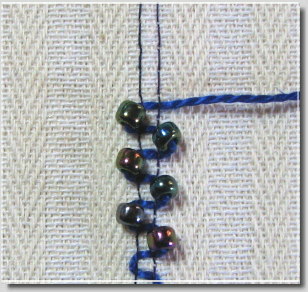 The last technique produces a straight row of beading with diagonal lines of perle cotton showing between the beads. Begin by bringing your thread up to the surface on the bottom left, crossing over to the right, and then passing your thread under the first (single) stitch (working from right to left). 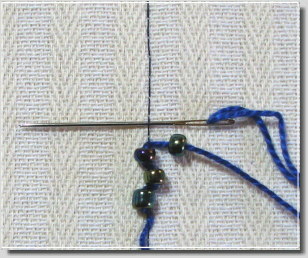 Thread a bead onto your needle and then pass the needle under the second stitch on the left (working right to left). 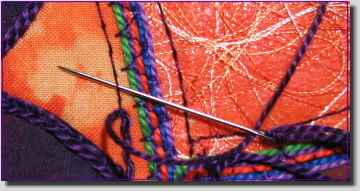 Position your needle with the point facing the left hand line of stitches. 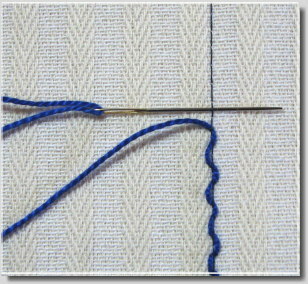 Pass the needle horizontally under both stitches of the next row. 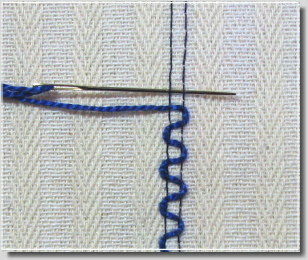 Thread another bead onto your needle and pass the needle under the second free stitch of the left hand row of stitches, working in a diagonal motion. Repeat these two steps until your row of stitches is complete. Although each bead will have a diagonal slant, the row will be straight and even. 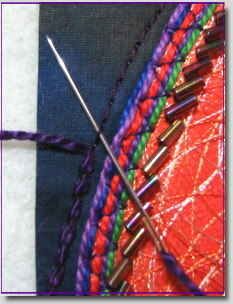 This technique can also be worked with beads added on the horizontal stitches rather than the diagonal stitches. That is how I worked some of the beading on the In Bloom Three project. You can also work the pattern in diagonal stitches alone, threading every other stitch with beads. 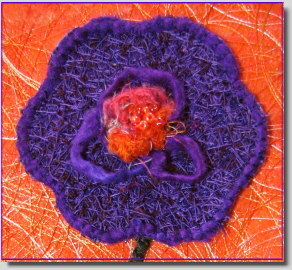 In part five, I’ll share with you how I created the flower using free motion embroidery, silk roving, and beads. I have the honor of being tagged by Elaine at http://http://stitchtherapy.blogspot.com, Terri at http://http://lavenderbetweenthecracks.blogspot.com, and Emmy at http://emmyschoonbeek.blogspot.com for the Thinking Blogger Award (http://www.thethinkingblog.com/2007/02/thinking-blogger-awards_11.html). Wow, what can I say except thank you very, very much for placing Fembellish Journal in the company of so many wonderful blogs. This honor comes at the same time as the birth of my grandson Joshua , who arrived today weighing in at the cutest 9.5 pounds you’ve ever seen. When I get back home (and get a good night’s sleep), I will honor five blogs who make me think. Thank you Elaine, Terri, and Emmy for considering my blog worthy of your recognition. I love the techniques I’m about to share with you They can be used for decorative embellishments on all sorts of projects, adding lots of visual interest. For this phase of the project, you will need a tapestry needle, beads with holes large enough for the eye of the needle to pass through, and some perle cottons. I call the first technique “reverse couching.” The tight wavy line that reverse couching produces makes it a good candidate for small stems, branches, vines, and general outlines of flowers and other objects. 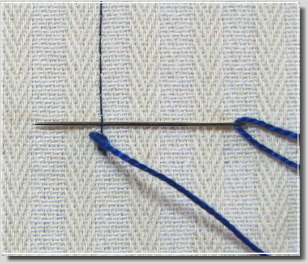 To work reverse couching, sew a line of straight stitches at 4.0 mm using a strong thread. The line can be straight, curvy, or any shape you like. 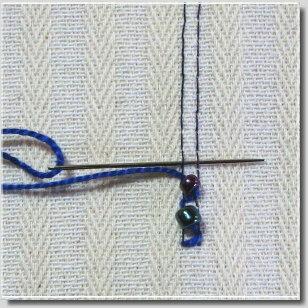 Thread a tapestry needle with matching perle cotton and bring it up at the bottom end of your stitches. Now, with the point of your needle to the right of the next stitch, pass the needle under the stitch and come out on the left side. Cross your needle over the stitches and again pass the needle under the next stitch, working from right to left. Continue this same motion until your line of stitches is complete. Of course, you could use any number of different threads with this technique, adjusting the stitch length to accommodate the various thread (or yarn) sizes. Here are the places on In Bloom Three where this stitch is worked. I used a #5 perle cotton on the lower area of the project and a #3 peril cotton near the top. The second technique is a variation of the first. (Although I didn’t use this one on the project, it’s a nice stitch to have in your repertoire.) 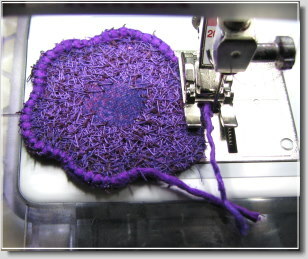 With the point of your needle to the right of the stitch, pass your needle under the stitch. 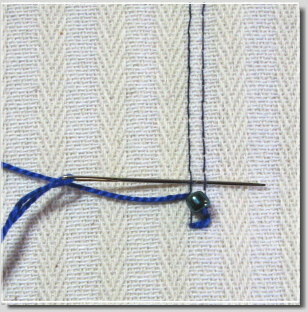 Now, position the point of your needle to the left of the next stitch and pass it under, coming out on the right side. Repeat this motion until your line of stitching is complete. This variant produces a wider wave effect than the first technique. 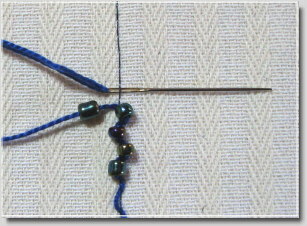 Taking this one step further, before each pass of the needle, string a bead onto your thread and then pass the needle under the stitch, working right to left and then left to right. 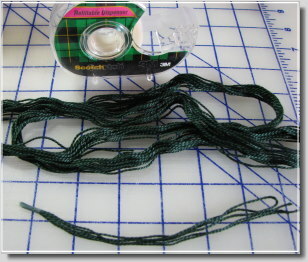 This is a great way to attach beads since your line of stitching serves as the perfect guide. 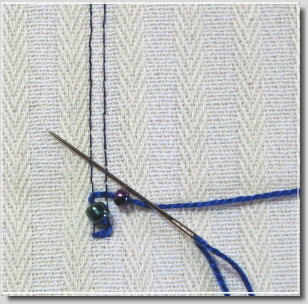 In part four, we’ll transition to perle cotton techniques using a double line of stitching. Many great products that we use for quilting and fiber art come from other sources. I purchase freezer paper at the grocery store, rubber finger tips at the office supply store, Tri-flow at the bike shop, magnetic trays at the hardware store, and the list goes on and on. In this tutorial we will be using Glad Press’n Seal, a product you can find at the grocery store near the freezer paper. Press’n Seal is slightly tacky and transparent, making it perfect for transferring designs, positioning them on fabric, and stitching over them. It’s very easy to remove and doesn’t put strain on your stitches the way some other products do. I also use Press’n Seal to secure thread ends on large spools. With our background complete, we now begin the thread work. Place a large piece of Press’n Seal over your drawn (paper) design and mark double stitching lines between each of the individual template pieces. These lines should be 3/8 of an inch apart. 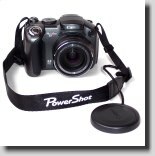 Remove the Press’n Seal and position it on your fabric background. 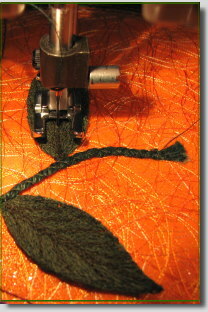 Using a strong thread, such as polyester, stitch over the lines using a stitch length of 4.0 mm. When you’ve completed stitching all the marked lines, gently tear away all the Press’n Seal. 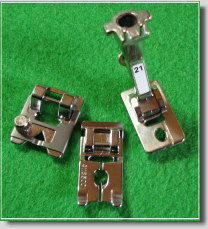 Then set up your sewing machine with a 5-hole or 7-hole cord foot. If you’ve never used this foot before, you thread individual cords through the small holes from the top of the foot, working them under the foot. I used #5 perle cotton in five colors, but you could use as many as seven colors. 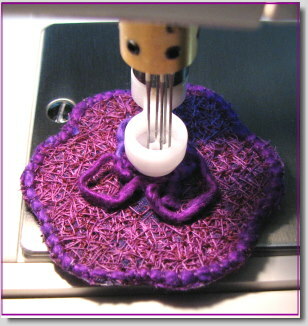 Choose a stitch on your machine that will catch all the cords as you sew. Decorative stitches work well here. Slowly sew the cords through the center of all the double stitching lines, using care to not stitch over any of the double stitching lines themselves since you will need these to be free for other techniques. Leave about an inch of cord tails at the beginning and ending of each section. Next, attach a braiding foot or a free motion couching foot and apply a heavy decorative thread, such as #3 perle cotton, to the edges of any fused design elements. Remember to drop your feed dogs if using the free motion couching foot. This colorful project is packed with techniques that I’m looking forward to sharing with you. 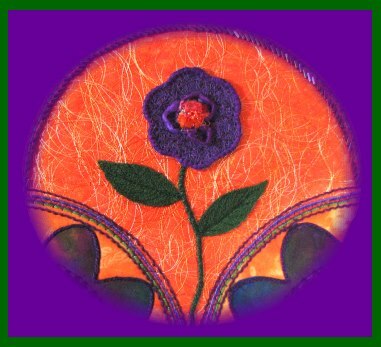 As with all my tutorials, you can tailor them to fit the type of fiber art work you enjoy creating. 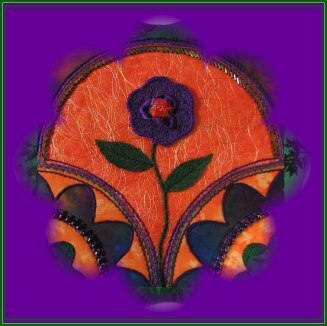 For part one, you will need three cotton prints (hand dyed or hand painted fabrics works well), craft felt, a fusible such as Wonder Under or Steam-A-Seam, fabric paints, and rayon thread. First, draw your design on white paper and cut out the individual templates. Back your fabrics with fusible and cut out each individual piece. Fuse your design pieces, with the exception of the focus background piece, to a piece of craft felt cut a few inches larger than your finished design. Next, prepare your work area for fabric painting. You can use a single paint color or mix fabric paints to achieve the color you desire. Place a piece of fusible cut larger than your template on a covered surface. Using a brush or sponge, paint the fusible side of the Wonder Under or Steam-A-Seam. Set it aside and allow it to dry. Once your fusible is dry, place your focus background fabric on a Teflon pressing sheet or parchment paper (right side up) and top it with the painted fusible (fusible side down). Top these with another piece of parchment paper. Press on cotton setting for 15-20 seconds. The painted fusible takes a little longer to transfer to the fabric. Allow the fabrics to cool before removing the parchment and fusible backing paper. If the paint and fusible haven’t completely transferred, press a little longer. Holding your rayon thread over the painted fusible, allow the thread to naturally fall on the surface, forming circular shapes. When the entire surface is covered with thread, place a piece of parchment paper on top and press for 7-8 seconds. When the fabric has cooled, check to make sure all the threads are secured by the fusible. If any are loose, cover and press again. Place your template on the focus background piece and cut to size. Position the piece on the craft felt, cover with a Teflon pressing sheet, and press. Allow to cool and carefully remove the pressing sheet. The paint wanted to stick in a few places when I removed my pressing sheet, so I pressed for a few more seconds until the design was securely fused. Your design background is now complete. In part two, we’ll begin adding detail with perle cottons and multiple cords. While shopping in a local craft store, I noticed these plastic shapes with raised surfaces. I believe they’re used to create imitation stained glass. I purchased a few of them and found them to work quite well as rubbing plates with Shiva Paintstiks. Using the same Kona cotton fabric as used in part two (prewashed), I rubbed the flower design onto the surface using a white Shiva Paintstik. After allowing it to dry and giving it a gentle wash (see part two), I set up my sewing machine with white rayon thread and lowered the feed dogs. I then did a free motion outline stitch around the smaller flowers and filled in the centers. Next, I attached the Bernina Free Motion Couching Foot and couched a #4 cotton around the larger flower. This could also be done by winding the heavy #4 cotton onto a bobbin and stitching the design from the back side of the fabric. This simple design resulted in a beautiful embellishment that took very little time to create. For the dragonfly, I decided to stipple his wings and thread paint his body. I began with the wings. Then I filled in his lower body with a brown cotton embroidery thread. Next, I filled in his head with Holoshimmer. Finally, I outlined his body with gold Holoshimmer. Shiva Paintstiks made the transfer of the shapes simple and quick. Once on fabric, there were many things I could have chosen to do with each design. I hope you’ll do a little experimentation and enjoy the versatility that these paintstiks offer in the studio. Shiva Paintstiks allow us to transform a plain fabric into something eye-catching and beautiful. Possibly you’ve seen the application of Shiva’s iridescent paintstiks on a black background and the striking results. In this project, I’m taking you in the opposite direction by using the color white. If you’ve ever admired shadow appliqué, you will appreciate the similar effects that you can achieve with a white Shiva Paintstik. In shadow appliqué, various colors of fabric are placed on the wrong side of a sheer fabric, allowing the design to show through. The outline of the shape is then stitched on the right side of the fabric along with some embroidery embellishments, resulting in a delicate, pristine surface design. For this project you will need freezer paper, a pastel background fabric (I used a Kona cotton), Shiva Paintstiks in white and yellow, rayon thread, and some beads. Begin by drawing a simple design on a separate piece of paper. I started with a circle and then formed petals to create my flower. Cut the design out and transfer it to the matte side of the freezer paper using a pencil or marker. Cut the design out of the freezer paper, making sure your design edges are smooth. Place your freezer paper design shiny side down on the right side of your fabric and press with a warm iron until the paper fully adheres to the surface. Next, prepare a work area just as you would for fabric painting, making sure the surface is protected. Secure your fabric with tape to a hard flat object, such as a large tile or plate of glass. Remove the thin skin from your white Shiva Paintstik (see part one) and gently color in the design area. You can apply the paintstik directly or you can use a stencil brush. Your design won’t look all that wonderful at this stage, but that will soon change. 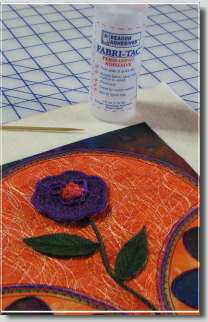 Now add a yellow center to your flower using the original pattern template with the center cut out. You don’t have to wait for one color to dry before using another. With Shiva Paintstiks you can layer colors simultaneously or blend colors together to produce new colors. Once your design is complete, peel off the freezer paper. If there are any flakes of skin residue, remove them with a point of a knife or similar object. At this point I detour a bit from the usual directions by placing my design between two paper towels and lightly pressing (silk setting) for about 6 seconds. This is not for the purpose of heat setting but rather to even out the painted design. By doing this, your design will lose its grainy look and take on a solid, smooth appearance. You must now set your design aside and allow it to dry for a few days. Once dry, heat set by again placing it between paper towels (or paper bags) and ironing for about 15 seconds on each side. Use the heat setting appropriate for the background fabric. To remove any remaining chemical residue, wash your design in cold water with a small amount of detergent. You can do this in a washing machine, but I prefer to do this by hand and then lay the design on a towel to dry. You can also dry your design in a clothes dryer set at the low heat setting. Once you’ve completed the washing process, your design is ready for some embellishing. Begin by stabilizing your fabric. 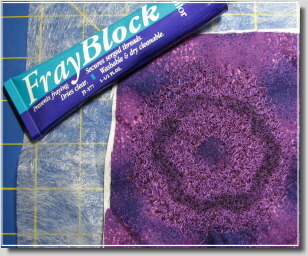 I use a fusible cotton tear away purchased from ABC Embroidery (see Fiber Art Resources page). It’s a wonderful product that I highly recommend, especially to quilters who embellish with embroidery. It’s easy to remove, but can also be left in the design because it’s light weight and softens when washed. 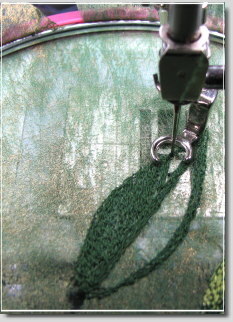 Whatever stabilizer you use, take care when removing it from around your stitching. 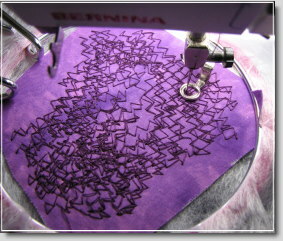 Set up your sewing machine for free motion embroidery, making sure you’ve dropped the feed dogs. 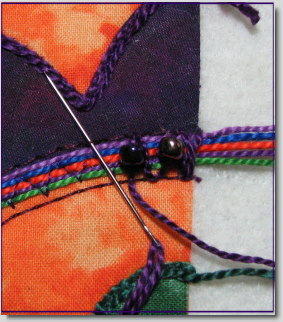 Using a rayon thread (or any decorative thread you like), stitch around the edges of your design. Remember to loosen your top tension when using decorative threads. 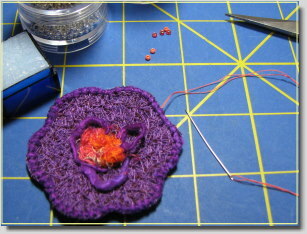 Next, move to the center and detail stitch the petals. As a final embellishment, add some beads at the end of each petal detail. When removing the stabilizer, you may like to leave the part behind your design since the white stabilizer enhances the white of your design. Now, have you ever seen anything so delicate and beautiful? I hope this little project will serve as a starting point for some great adventures with Shiva Paintstiks. In part three, I’ll share some other simple tools that I use to create surface designs with Shiva Paintstiks. When quilters moved from traditional quilts to contemporary quilts to art quilts, many tools and techniques once used on canvas crossed over into fiber art. One of those tools is Shiva Paintstiks. If you haven’t already used them yourself, you’ve probably seen the work of those who have integrated them into their craft. Shiva Paintstiks (also called Markal Paintstiks) are a combination of refined linseed oil, pigment, and wax, solidified into solid stick form. Unlike other oil bars, the linseed oil in the Shiva bars is highly refined, less acidic, and fast drying. Therefore, they do not leave an oil outline when used on fabric. Within 24 hours they will be dry to touch. However, they take 3-5 days to fully dry and must be heat set to be permanent. Following the drying time, give your project a gentle wash to remove remaining chemical residue. Do not dry clean..
One characteristic of the paintstiks has both a positive and negative aspect to it. They are self-healing, which means they form a skin after use. This makes for less waste but it also means that the skin has to be removed each time you work with them. I use a sharp knife with a thin blade. The skin is very thin so don’t take off too much in the process. Sometimes the skin flakes intermingle with your work, but they are easy to remove. Since I’m not crazy about the skin or the flakes, I cover my paintstiks with Glad Press n’ Seal if I plan on using them a few days in a row. This retards the formation of the skin and keeps them sealed at the same time. The first time you use them, practice on a scrap of fabric to get the feel of how they work. Don’t press too hard and work in a consistent linear motion. Although rubbing plates are available, experiment with other items that have interesting raised designs on their surface. I used a plant stand in the example below. One of my favorite rubbings is random dots found on a textile plate intended for clay. Additionally, you can make your own raised designs with string or wire. Also, keep your eyes open when shopping and you’re sure to find items that can be adhered to a firm surface and serve as an original rubbing plate. For example, I found decorative paper clips in the scrapbooking section of a local craft store that worked well. Simply glue them to a piece of wood or similar object. Rubbings are not the only use for paintstiks, though. You can use commercial stencils or stencils you create yourself to decorate fabric. It is best to use a stencil brush to apply thepaintstik to the fabric. As an alternative, you can paint directly onto the fabric and then use an old toothbrush to rub the paint evenly into the fabric. Shiva Paintstiks come in both matte and iridescent colors, and they can be blended to create even more colors. I like to use one of the citrus solvents for cleanup, but they don’t really make much of a mess. Regular soap is all you need to clean your hands. However, do prepare your work area just as you would for fabric painting. In part two, we’ll get to some creative ways to use Shiva Paintstiks in projects. The lubricant is also a great aide when doing free motion work at high speeds since it eliminates friction. Simply put a few drops on a Q-tip and coat your sewing machine needle. With fusibles, you may need to recoat the needle several times throughout the sewing session. Although Tri-Flow is advertised for bicycles, bearings, and the movable parts on machinery, many sewing machine technicians use this product in their workshops. At home, you can clean your bobbin area (metal parts) with Tri-Flow and remove dirt and dust from the surrounding surfaces. It displaces moisture and prevents corrosion. If you use metal bobbins, you can coat the interior before winding them with thread. However, Tri-Flow is NOT a replacement for your sewing machine oil. If your machine requires oiling, follow your manufacturer’s instructions and only use the sewing machine oil recommended in your manual. You can find this product in bike shops, online, and at some sewing centers. For studio use, purchase the 2 ounce fluid (not the spray).